The risk of physical injury is part and parcel of sport at any level. Athletes put their bodies on the line to prove that they are the best in their field and claim victory over their opponents. Injury stops this pursuit in its tracks and can set an athlete’s progress back considerably. One minute you’re at the zenith of your physical powers, decimating the competition on a weekly basis, the next you’re wallowing in the nadir. Recovering from serious injury is a battle in more ways than one. Overcoming the physical and mental challenges connected with injury rank among the toughest obstacles an athlete can face in their career. 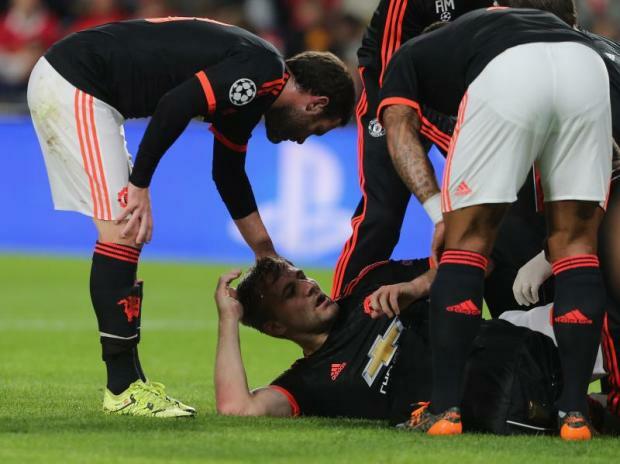 Manchester United and England’s Luke Shaw is at the beginning of one of football’s toughest journeys. The 20-year-old, left-back suffered a double fracture to his right leg as a result of a strong challenge from PSV Eindhoven defender, Hector Moreno and is more than likely set to miss up to 12 months whilst he fully recovers. How Shaw deals with the many struggles of such a serious, long-term injury will be key to a successful recovery. Physically dealing with the effects of long-term injury can be daunting in the first instance. Facing the prospect of being immobile for several months and the inability to do things for yourself is both frustrating and depressing in equal measure. Performing the simplest task becomes exponentially more difficult as moving from point A to point B becomes a painful struggle. The slightest twist or sharp movement sends debilitating bolts of pain shooting through the affected limb(s) and stops any activity in its tracks. Living a normal life becomes a chore. However, in my experience the mental challenges are often the toughest to deal with. You replay the scenario that led to the injury over and over in your mind; considering what you could have done differently to avoid it. Could you have made a different decision? Pulled out of a tackle or turned in a different direction perhaps? The recovery process itself is incredibly frustrating, each day you must summon the motivation to get out of bed despite knowing you have to face the same struggle for the duration of your waking hours. It’s essentially like conquering your own little mountain everyday as you recover, battling through each simple obstacle on the upward road to full health. Even after the body has healed, the mental battle continues as the process of rehabilitation begins. It’s a long and painful road as the body begins its journey back to the level of strength and fitness that it was at prior to injury. The body is pulled and pushed in many different directions as physiotherapists work to restore the normal range of movement to the affected area. Expressions of grimace and pain remain etched on your face as you endure session after session of painful rotation, flexion, extension, abduction and adduction of the affected area. Zito Madu recently wrote a brilliant piece for SB Nation about athletes recovering from long-term injury and the effects on the body and the mind. Zito drew largely on his own experiences which I’m sure resonate with amateur and professional athletes alike. Zito referred to a “crippling self-doubt” and a fear of the body breaking that holds a vice-like grip over you both mentally and physically as you attempt to return to running again. The doubt manifests itself openly as you limp through the strides that would normally flow freely as the body and the mind is held back by a fear that reaches out from the dark world of hurt that had previously consumed your life. It’s pretty simple at this point, you either sink or swim. Break through those mental and physical barriers or crash and burn in a heap of broken body parts. Every person will deal with this in their own way. My experiences have all come from injuries sustained playing amateur football, torn ligaments and broken bones cause all-sorts of disparate stress on the body and maintaining a positive attitude is key to the recovery process. Consider an elite athlete like Shaw has his livelihood at stake; it highlights the seriousness of the effects of a long-term injury and the positive work that goes into the recovery and rehabilitation process. It’s not simply a player’s physical well-being at stake; it’s their future and their work that is under-threat as the physical and mental scars can last much longer than a career in elite sport does. Shaw will be surrounded by some of the best medical staff in the world at Manchester United however; he will still have to endure the same physical and mental battles which any person would face in his situation. As he begins the road to recovery he will be able to take solace from fellow players like Arsenal’s Aaron Ramsey who fought back from a double fracture of his right leg sustained against Stoke City in 2010. Ramsey was around the same age as Shaw at the time of his injury and the Welshman has played some of the best football of his career since he returned to action. Shaw has time on his side and like Ramsey, there is every chance that he can return to full fitness and become even stronger as a result.